Equity & Inclusion in Architecture—the AIA is talking about it, but what’s being done to improve it in our profession? 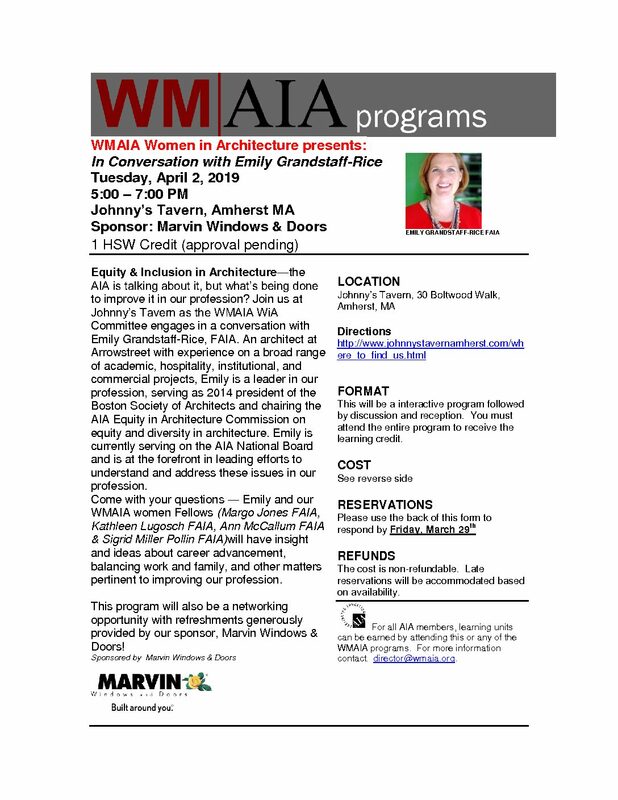 Join us at Johnny’s Tavern as the WMAIA WiA Committee engages in a conversation with Emily Grandstaff-Rice, FAIA. An architect at Arrowstreet with experience on a broad range of academic, hospitality, institutional, and commercial projects, Emily is a leader in our profession, serving as 2014 president of the Boston Society of Architects and chairing the AIA Equity in Architecture Commission on equity and diversity in architecture. Emily is currently serving on the AIA National Board and is at the forefront in leading efforts to understand and address these issues in our profession. Come with your questions — Emily and our WMAIA women Fellows (Margo Jones FAIA, Kathleen Lugosch FAIA, Ann McCallum FAIA & Sigrid Miller Pollin FAIA)will have insight and ideas about career advancement, balancing work and family, and other matters pertinent to improving our profession. This program will also be a networking opportunity with refreshments generously provided by our sponsor, Marvin Windows & Doors! * This will be a interactive program followed by discussion and reception. You must attend the entire program to receive the learning credit. Click on the image below to enlarge and download or print the REGISTRATION FORM.